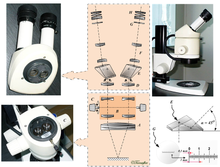 The stereo, stereoscopic or dissecting microscope is an optical microscope variant designed for low magnification observation of a sample, typically using light reflected from the surface of an object rather than transmitted through it. The instrument uses two separate optical paths with two objectives and eyepieces to provide slightly different viewing angles to the left and right eyes. This arrangement produces a three-dimensional visualization of the sample being examined. Stereomicroscopy overlaps macrophotography for recording and examining solid samples with complex surface topography, where a three-dimensional view is needed for analyzing the detail. Unlike a compound light microscope, illumination in a stereo microscope most often uses reflected illumination rather than transmitted (diascopic) illumination, that is, light reflected from the surface of an object rather than light transmitted through an object. Use of reflected light from the object allows examination of specimens that would be too thick or otherwise opaque for compound microscopy. 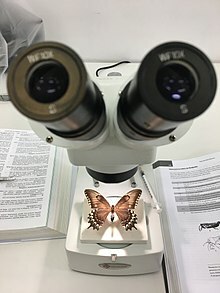 Some stereo microscopes are also capable of transmitted light illumination as well, typically by having a bulb or mirror beneath a transparent stage underneath the object, though unlike a compound microscope, transmitted illumination is not focused through a condenser in most systems. Stereoscopes with specially-equipped illuminators can be used for dark field microscopy, using either reflected or transmitted light. Great working distance and depth of field are important qualities for this type of microscope. Both qualities are inversely correlated with resolution: the higher the resolution (i.e. the greater the distance at which two adjacent points can be distinguished as separate), the smaller the depth of field and working distance. 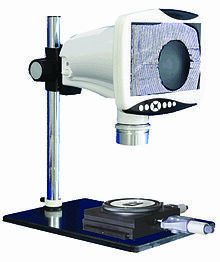 Some stereo microscopes can deliver a useful magnification up to 100×, comparable to a 10× objective and 10× eyepiece in a normal compound microscope, although the magnification is often much lower. This is around one tenth the useful resolution of a normal compound optical microscope. The large working distance at low magnification is useful in examining large solid objects such as fracture surfaces, especially using fibre-optic illumination as discussed below. Such samples can also be manipulated easily so as to determine the points of interest. There are severe limitations on sample size in scanning electron microscopy, as well as ease of manipulation in the specimen chamber. There are two major types of magnification systems in stereo microscopes. One type is fixed magnification in which primary magnification is achieved by a paired set of objective lenses with a set degree of magnification. The other is zoom or pancratic magnification, which are capable of a continuously variable degree of magnification across a set range. Zoom systems can achieve further magnification through the use of auxiliary objectives that increase total magnification by a set factor. Also, total magnification in both fixed and zoom systems can be varied by changing eyepieces. Small specimens necessarily require intense illumination, especially at high magnifications, and this is usually provided by a fibre-optic light source. Fiber optics utilize halogen lamps which provide high light output for a given power input. The lamps are small enough to be fitted easily near the microscope, although they often need cooling to ameliorate high temperatures from the bulb. The fibre-optic stalk gives the operator much freedom in choosing appropriate lighting conditions for the sample. The stalk is encased in a sheath that is easy to move and manipulate to any desired position. The stalk is normally unobtrusive when the lit end is near the specimen, so usually does not interfere with the image in the microscope. Examination of fracture surfaces frequently need oblique lighting so as to highlight surface features during fractography, and fibre-optic lights are ideal for this purpose. Several such light stalks can be used for the same specimen, so increasing the illumination yet further. More recent developments in the lighting for dissecting microscopes include the use of high-power LEDs which are much more energy efficient than halogens and are able to produce a spectrum of colors of light, making them useful for fluorophore analysis of biological samples (impossible with a halogen or mercury vapor light source). 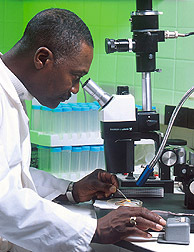 Video cameras are integrated into some stereo microscopes, allowing the magnified images to be displayed on a high resolution monitor. The large display helps to reduce the eye fatigue that would result from using a conventional microscope for extended periods. In some units, a built-in computer converts the images from two cameras (one per eyepiece) to a 3D anaglyph image for viewing with red/cyan glasses, or to the cross converged process[clarify] for clear glasses and improved color accuracy. The results are viewable by a group wearing the glasses. More typically, a 2D image is displayed from a single camera attached to one of the eyepieces. ^ a b "Introduction to Stereomicroscopy" by Paul E. Nothnagle, William Chambers, and Michael W. Davidson, Nikon MicroscopyU. ^ "Illumination for Stereomicroscopy: Reflected (Episcopic) Light" by Paul E. Nothnagle, William Chambers, Thomas J. Fellers, and Michael W. Davidson , Nikon MicroscopyU. ^ "Illumination for Stereomicroscopy: Darkfield Illumination" by William Chambers, Thomas J. Fellers, and Michael W. Davidson , Nikon MicroscopyU. Wikimedia Commons has media related to Stereo microscopes.